Bathyscaphe Trieste: The Bathyscaphe Trieste lifted out of the water, circa 1958-59. U.S. Naval Historical Center Photograph. On January 23, 1960, Jacques Piccard and Don Walsh boarded the Bathyscaphe Trieste sea vessel and descended to the deepest part of the ocean: The Challenger Deep in the Mariana Trench. Where is the Mariana Trench? The Mariana Trench is located in the western Pacific Ocean. It was discovered to be 10,924 meters deep in 1951 by researchers aboard the British survey ship Challenger. Trieste was the first vehicle to explore the trench with a crew of two people. Map by Geology.com and MapResources. 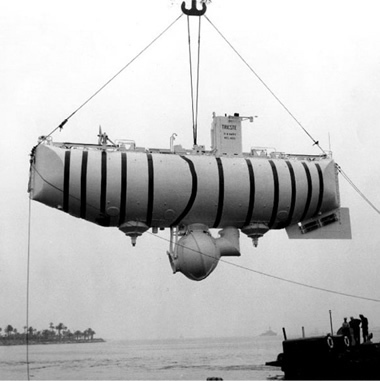 A bathyscaphe (pronounced BA-thi-skaf; meaning: "deep ship") is a submersible vessel with a spherical room for research and observation. This observation chamber is attached to the bottom of a tank filled with gasoline. Gasoline is more buoyant than water and is highly resistant to compression, which makes it well-suited for the high pressure of deep-sea dives. Trieste (pronounced TREE-est-a) was the name given to the bathyscaphe that would make history by traveling into the Challenger Deep on January 23, 1960. It was named after the city in which it was built, on the border between Italy and Yugoslavia. The Trieste carried hydronauts Don Walsh and Jacques Piccard approximately 11,000 meters underwater - that is, about 11 kilometers (or 7 miles) into the deepest part of the Pacific Ocean. The ship's instruments initially registered the vessel's depth to be 11,521 meters, but this was later recalculated to 10,916 meters. More recent measurements indicate the bottom of the Challenger Deep to be roughly 11,000 meters below sea level. 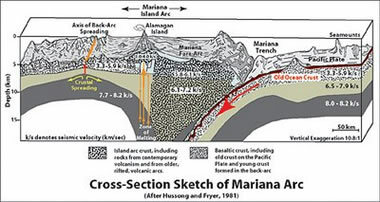 Mariana Trench Cross-Section: The Mariana Trench is the boundary between two tectonic plates: the Pacific Plate and the Mariana Plate. Image by NOAA. Within the Mariana Trench, there is a small valley that goes even farther into the Earth's crust - this spot, called the Challenger Deep, is the deepest part of the ocean. The distance between the ocean's surface and the bottom of the Challenger Deep (11,000 meters) is greater than the height of Mount Everest (8,850 meters). That means if you were to put the world's highest mountain inside the deepest part of the ocean, the mountain's peak would still be more than 2 kilometers underwater! 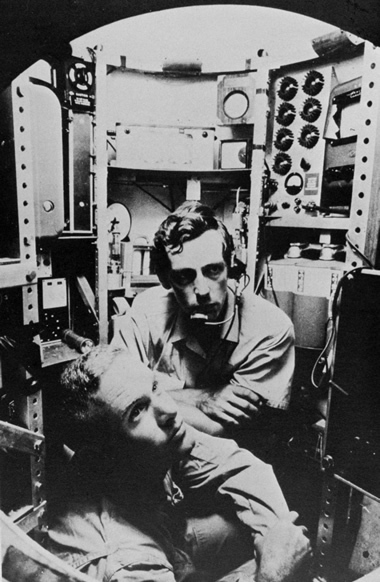 Don Walsh and Jacques Piccard: Lieutenant Don Walsh, USN, and Jacques Piccard in the bathyscaphe TRIESTE. Location: Mariana Trench, 1960. NOAA Ship Collection. Oceanographer Jacques Piccard (1922-2008) worked with his father Auguste to design the Trieste. Auguste Piccard, a scientist from Switzerland, had experimented with buoyancy methods for his balloon flights - in fact, he broke the record for the highest altitude balloon flight in 1931-1932. He applied this knowledge about buoyancy to design the Trieste. So, interestingly, the Piccard family holds the record for both the highest altitude balloon flight and the deepest ocean dive. Oceanographer Don Walsh (b. 1931), a Lieutenant of the United States Navy, was the other explorer in the Bathyscaphe Trieste's small pressure sphere. He has spent over 50 years in oceanic research, and is celebrated by Life magazine as one of the world's great explorers. The descent into the Challenger Deep took nearly five hours. Once the Bathyscaphe Trieste reached the sea floor, Walsh and Piccard observed their surroundings. The ship's light allowed them to see what they described as a dark brown "diatomaceous ooze" covering the sea floor, along with shrimp and some fish that appeared to resemble flounder and sole. Since the Plexiglas viewing window had cracked during the descent, the men were only able to spend about twenty minutes on the sea floor. Then, they unloaded the ballasts (nine tons of iron pellets, and tanks filled with water) and began to float back to the ocean's surface. The ascent was much quicker than the dive, taking only three hours and fifteen minutes. Since this monumental voyage, unmanned, remotely operated crafts have ventured into the Challenger Deep - such as Kaiko in the late 1990s, and Nereus in 2009. However, Jacques Piccard and Don Walsh are still the only two people to have ever traveled to the bottom of the Mariana Trench, and see the deepest part of the ocean firsthand.